If you’ve been reading our posts about each of our 2015 bikes you may have noticed me saying this one’s a “favorite”, or that one’s “our favorite”. Well, this bike is my REAL favorite model of the 2015 line. The Weekender with drop bars is so nice to ride and I’m very excited for you all to see it (and ride one). I feel like we absolutely nailed the spec on this bike and it has created a bike that is very special. 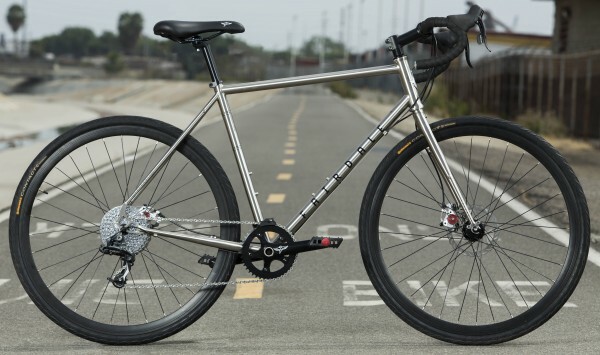 The Drop Weekender is a tough, all-purpose road bike. It is reliable transportation that can keep you out of cars, and keep you smiling. One of the key features of this bike is the 1×10 drive-train. By using a large range cassette (11-36t) we are able to create a bike that has a similar gear range as a normal 2×10 road bike. However, by removing the front derailleur the shifting on this bike is greatly simplified. Using just one shift lever to handle all your shifting is really a treat. The full range of gears are readily usable at the tip of your fingers, it truly makes this bike great to ride. We used a long-cage SRAM X7 Type 2 rear derailleur to handle moving the chain around the cassette. This is another special part of the bike. 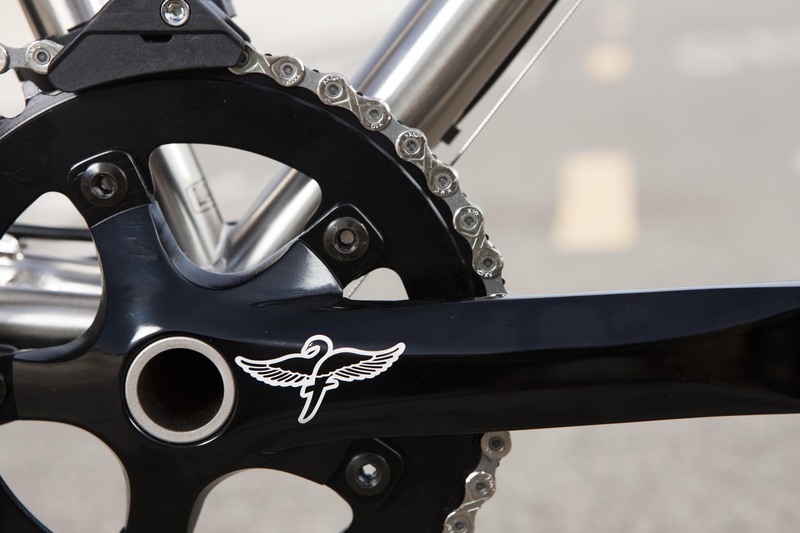 The Type-2 designation is for SRAM’s clutch system built into the derailleur. This was developed for mountain biking (and indeed this tough part is typically a mountain derailleur). 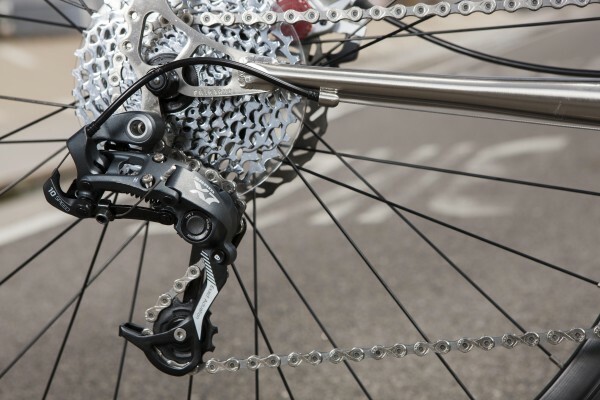 The internal clutch system keeps the derailleur from bouncing around on rough roads. The result is that riding this bike feels and sounds like a single-speed. Your drive train will feel remarkably solid and stable. Ride off a curb and you won’t get the usual chain slap you would get from a bike with a normal derailleur. It’s really a cool feature that is something you need to ride yourself to understand, but we do think you will like it as much as we do. Also, we chose to use a long-cage incase you did want to upgrade your bike to a 2×10 (say you’re going to do a big bike tour with a lot of weight strapped on to your bike). The long-cage can accommodate this. 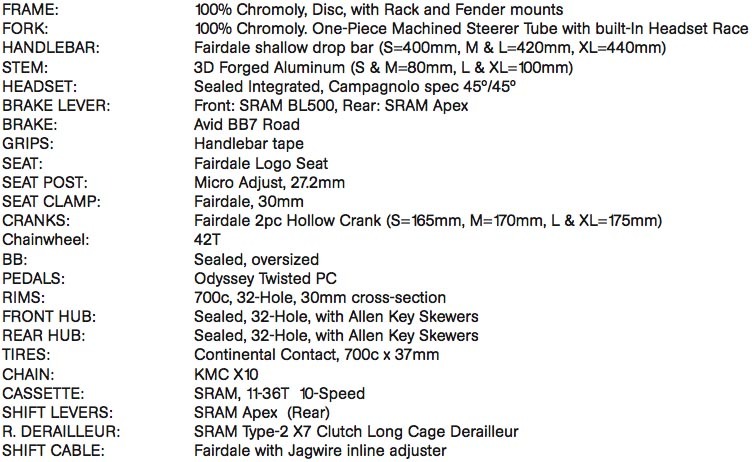 This bike comes with Fairdale’s oversized-spindle 2pc cranks that have a nicely sealed outboard bottom bracket. Again this adds to the incredibly solid feel of the Drop Weekender. 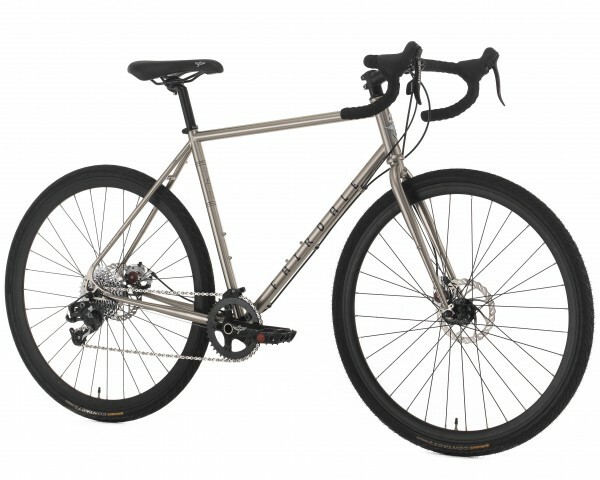 The Weekender is based on our doubled-butted 4130 Chromoly frame design. 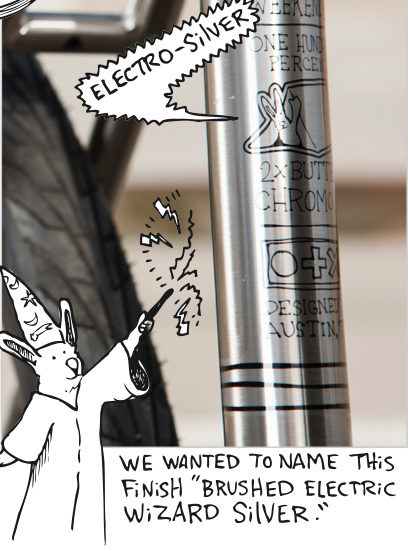 The fork is full Chromoly and uses our 1-piece machined steer tube for superior trustworthy strength. For 2015 the Weekenders see the top tube (TT) becoming more level as the bike gets bigger. So, our small’s TT is fairly sloped to better fit smaller riders, but by the time the bike gets to an Extra Large size the TT is almost level (large shown in these photos). We feel we found a good balance between aesthetics and practicality. You’ll find easy to use (front and rear) rack and fender mounts. This will allow you to adapt it to your riding as you need. Pop some fenders on there for wet weather, or racks to carry your bags and stuff. 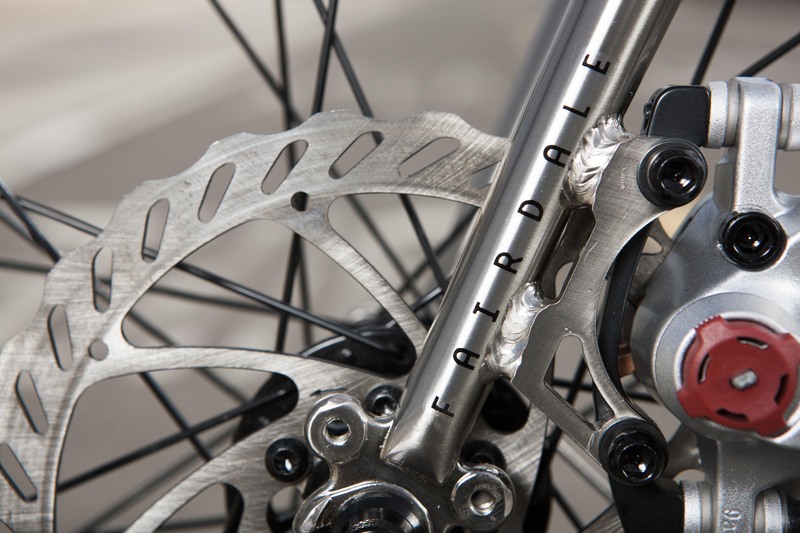 The brakes on the Drop Weekender are Avid’s very nice BB7 Road brakes. 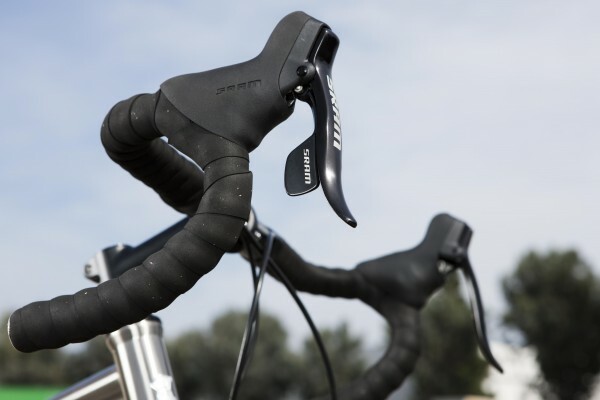 Very easy to adjust, very powerful and they feel awesome through SRAM’s brake levers. Since the bike is a 1×10 one brake lever is also your shift lever. A SRAM Apex shift lever handles this job beautifully. The other lever is just a brake lever, but matches the shift lever in feel and appearance. *Please ignore the absolutely wretched bartape wrap job in this photo (note to self, don’t let photographers wrap handlebars for photo shoots… ha ha). The Electro-Silver finish is a very special finish that is both eye-catchingly beautiful with out being obnoxiously loud. The bike is rounded out with 37mm Continental Contact tires, sealed integrated headset and Fairdale saddle. The Drop Weekender will be in USA bike shops for around $1250.